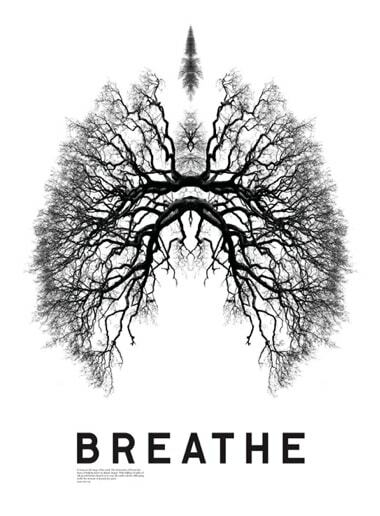 Breathing is an exceptional function of the body. Even though it is automatically regulated by the Autonomic Nervous System (ANS), it can be consciously modified. This is remarkable, given that ‘autonomic’ implies that something cannot be controlled by the mind. Both the sympathetic and the parasympathetic nervous system are parts of the autonomic nervous system. These systems work in balance with one another, and directly or indirectly affect almost every structure in the body, including heart frequency, heart capacity, lumbar function, kidneys, blood vessels, stomach, and intestines. Yogic traditions claim that all functions of the body controlled by the ANS – including the beating of the heart – can eventually become volitional with extensive practice. But to get to that point, it is necessary to concentrate on the breath. The sympathetic nervous system has an active ‘pushing’ function, and the parasympathetic nervous system has mainly a ‘relaxing’ function. The nervous system is located on both sides of the spine, and consists of ganglias. The autonomic nervous system is most important in two situations: emergency, stress-inducing ‘fight or flight’ situations, and non-emergency situations that allow us to ‘rest and digest’. The autonomic nervous system also reacts in ‘normal’ situations to maintain normal internal functions. During deep, prolonged inhalation, a pressure is created in the thoracic cavity. This stimulates several effects of the sympathetic nervous system – the branch of the autonomic nervous system that generates a ‘flight or fight’ response. The most notable of these responses are temporary increases in heart rate or blood pressure. Deep, prolonged exhalation tends to activate the opposite branch of the autonomic nervous system – the parasympathetic – which boasts its own set of effects. These include the temporary, but immediate, drop in both heart-rate and blood pressure.